Senior Scout Jack after many years in the 2nd. Goring & Streatley BBS Scout Group and passing many tests and badges to develop good citizenship by forming his character and developing skills in leadership, observation, obedience, self-reliance, inculcating loyalty and thoughtfulness for others; service to the public and promoting his physical, mental and spiritual development has finally achieved the highest accolade award for a Scout, that of the �Grand Scout Master Crown Award� which is identical in the training and skills to be achieved as required for the Boy Scout Association�s �Queen Scout Award� before this changed in the 1960�s. The last Senior Scout in Goring or Streatley to gain such an award was approximately 1958/1960 this demonstrates very high standard that this award commands and is acknowledged both publically, by employers and also counts towards university entrance. Apart from gaining many well-earned badges both in public service, scouting skills and undertaking very adventurous activities planned and executed by Jack accompanied by one or two other Scouts; he has also had to carry out a lengthy period of community public service; be recommended by the Scout Group Council as a suitable recipient; and then be interviewed by the National Chief Commissioner to test his knowledge of scouting, his commitment and continuation in scouting for the benefit of others who follow. Finally, be recommended by the Grand Scout Master to be entitled to receive the award. Proudly Jack was presented with the Award by the National Scout Commissioner (as the Grand Scout Master was unfortunately absent because of illness) at the Annual Southern Area St. George�s Day Parade and Service this year held in Gloucestershire. The Commissioner then read out the �Charge� by stating �The solid foundation on which the Scoutcraft is built is the Scout Promise and Scout Law. Unless a Scout observes the Scout Promise and Scout Law to the best of his/her ability, by the very wording of the Promise and Law, he/she ceases to be a Scout�. I charge you Jack ever to remember, to discharge your duties as a holder of the Grand Scout Master Crown Award, to set an example to your fellow Scouts, and to place your knowledge of Scouting at the disposal of your Scouters, so that in the fullness of time, the other Scouts in your Scout Group, by your unselfish assistance, have knowledge of Scouting as you have�. Jack then had to respond stating �It has been a long but very enjoyable path in order to gain this the Grand Scout Master Crown Award. I Started by joining the Beavers at the age of 6 years, then 'Swimming Up' into the Wolf Cubs where I gained the 'Leaping Wolf', and then leaping up into the Scout Troop and after 12 years I have reached the path end and gained the great honour of receiving this award. On route I have had some really great experiences enjoyed in the company of many of you, whom I thank for sharing these experiences and giving support. I have particularly enjoyed the cycle /camps and camping generally, where I have always given my support and participation and gained so much from. I would therefore like to thank Skip David Cooksley for all the hard work, time and effort he puts into Scouting and running the Scout Troop. Which without that none of this would be possible, also my parents and family for their encouragement. Talking of the long path, my Scout hat has been with me since first joining the Scouts, I have looked after it and it has served me well having travelled to several countries, gone to many camps, and travelled many miles on the back of my bike at cycle/camps, but know I need to use the scouting skills I have gained to pass onto others, so sadly it is time to hang up my Scout hat and proudly wear a new Scouter's hat or Scout Leader hat as some may call that. Thank you all for this honour�. So I am pleased to report that Jack has become an Assistant Scout Master in the 2nd. 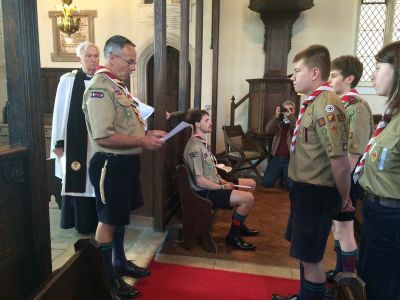 Goring & Streatley Scout Group where his Scouter name he has selected as �Gunner�.